Serve The Goddess Mobile Spa Services & Retreats brings pampering to homes and parties. Newport Beach Magazine featured Serve The Goddess as part of their Bespoke Beauty article published in December/January issue. Serve The Goddess encourages women to take better care of themselves. Read more here. 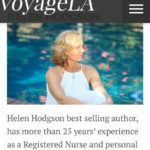 Voyage LA Magazine featured Helen Hodgson as one of LA’s most inspiring stories. Click here to find out more and share. MindBodyGreen published our article on how the healing power of touch can deepen your relationship. If you’re enthusiastic about deepening your relationship and connecting with your partner on a much more profound level, click here to read and share. 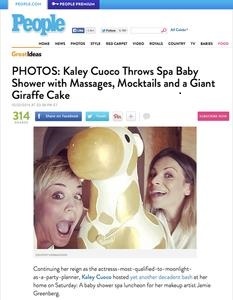 Kaley Cuoco (star of The Big Bang Theory) throws extravagant poolside spa and lunch do for her make-up artist Jamie Greenberg. Serve The Goddess was proud to provide all of the spa services including, massage, facials, manicure, pedicures, hair and make up. When Lauren Tatum, event planner, asked Serve The Goddess to provide spa services for her client, I had no idea how lavish it was going to turn out. And on top of that, it was to be a surprise for the guest of honor and her 50 guests. One of the best memories of the day was seeing Jamie, the guest of honor’s face as she was led outside where we were all eagerly waiting to surprise her. Her guests were equally taken aback and had no idea they were to be treated to a spa day! 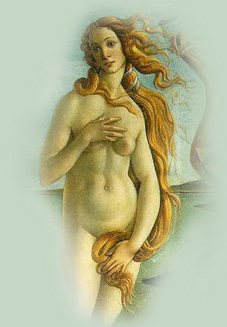 Helen Hodgson, Muse & Serve The Goddess Founder. Feeling Dull? Try the Salt Solution! When a woman imagines getting a massage it’s at least an hour long affair involving delicious smelling oils and soothing music. Your man may not, so make the minutes count by rubbing him the right way says Helen Hodgson. Don’t start on the bed. Instead put a comforter on the floor or a table. “Your bed will be too soft and you won’t be able to get good leverage therefore tire easily” says Hodgson a licensed massage therapist and registered nurse.Target your man’s trouble spots. “Women tend to carry tension in their lower backs, but men generally carry more tension in their shoulders, in between their shoulder blades and in their heads”, Hodgson explains. Concentrate on kneading and using long soothing strokes on those areas.Always keep one hand on his body, even if you’re reaching for more oil. “It keeps the continuum of touch”. If you stop he’ll wonder where you are, explains Hodgson. As for the oil, start out with a small amount and don’t pick anything too flowery. Guys lean toward sandalwood or wintergreen. Another reason for the growing popularity of facelift massage is that the procedure can be easily incorporated into a private practice. Clients love it! Helen Hodgson is the owner of Serve The Goddess® Mobile Spa Services in Los Angeles CA. She says facelift massage is the second most requested service, following only full body massage in her practice, where she also offers seated and Thai massage, reflexology and body scrubs. “Absolutely no equipment is required” she says, explaining the techniques ease of portability. “As all my work is mobile, it makes this treatment very convenient. Clients love it! Spending the day being pampered at a spa is a fine thing indeed, but it’s even more of an extravagance to be coddled in the comfort of your own home with a group of your closest friends. Serve The Goddess ® Mobile Spa Services strives to make the spa party experience an especially personalized and memorable one.Helen and Allison arrived early to set up massage tables and the various accoutrements of relaxation. As the name implies, Serve The Goddess® embraces the Greek deity theme. The spa offers a line of aromatherapy mists and oils with names like Aphrodite’s Delight and Demeter’s Retreat, and each attendee gets to choose a favorite scent to be incorporated into her treatments.We were each to receive a 30-minute full-body massage, plus our choice of a rejuvenating mini facial or a 30-minute foot reflexology treatment. But before the hands-on pampering began, Helen led us in a brief meditation. This helped us to achieve a state of calm and refocus our energy on the physical and spiritual rejuvenation to come.The next couple of hours were all about indulgence. After 30 minutes of blissful Swedish bodywork, Helen went straight into the facial, using hot towels and all-natural concoctions to cleanse and moisturize the skin. Because this was a mini facial, there were no extractions to suffer through, so the treatment only deepened the sense of relaxation and well being fostered by the massage. Preparing your skin for the summer and Sunless Tanning . Relationship Make Over. Couples massage segment. The benefits of couples massage for Valentine’s Day. Shop The world For Beauty Secrets. Berman and Berman Show. 2003 Couples Massage.